Electric vehicles will put the pressure on battery, oil and power demand. By 2035, there could be 125 million electric cars on the road, up from 2 million last year. The result: a steep upward swing in demand for batteries and electricity, and a similarly strong decline in global oil demand. A new report from Wood Mackenzie details the rise of electric cars around the world. It illustrates how electrification will bring a unique set of pressures for battery suppliers, utilities and oil companies. Take battery manufacturers. 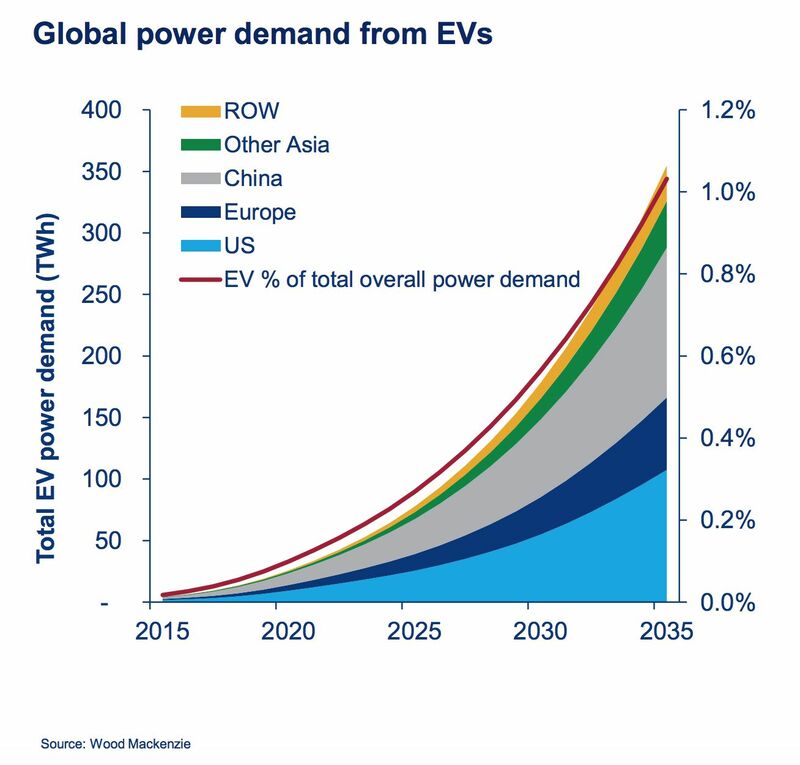 According to Wood Mackenzie, current capacity for EV batteries sits at 268 gigawatts by 2020. That’s much higher than 2020 demand, which barely touches 100 gigawatts. But in a decade, that picture changes. With spiking demand driven by Europe, the U.S. and China, battery demand exceeds current manufacturing capacity after 2028. By 2035, battery production needs to triple. A wider array of battery chemistries (lithium nickel manganese cobalt; lithium nickel cobalt aluminum; lithium manganese oxide) will help meet those rising needs, and Wood Mackenzie does not predict a shortage. However, if the uptake of electric vehicles increases at a faster rate than expected, production constraints could become a problem. Looking ahead to 2035, even as EV uptake increases exponentially, the broad impact on power markets is negligible. Those 125 million cars will likely add 135 terawatt-hours of power demand. That’s comparable to how much power Texas consumes, but it’s only 1 percent of the global market. It’s likely, though, that many of those cars will be concentrated in certain areas. That could present difficulties for utilities. Areas with pockets of electric vehicles -- Silicon Valley, for example -- could see problems arise along the distribution system. The next wave of smart chargers and time-of-use rates can help utilities juggle demand in areas with a concentrated supply of electric cars. The oil markets are a different story. 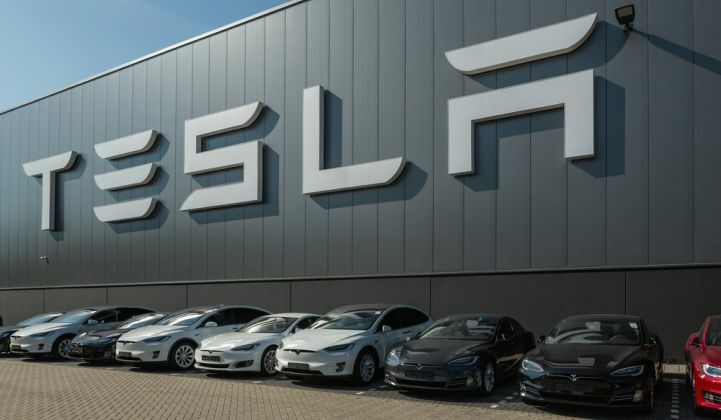 “Higher-than-anticipated EV sales will disrupt oil markets long before power sector impacts,” the report reads. 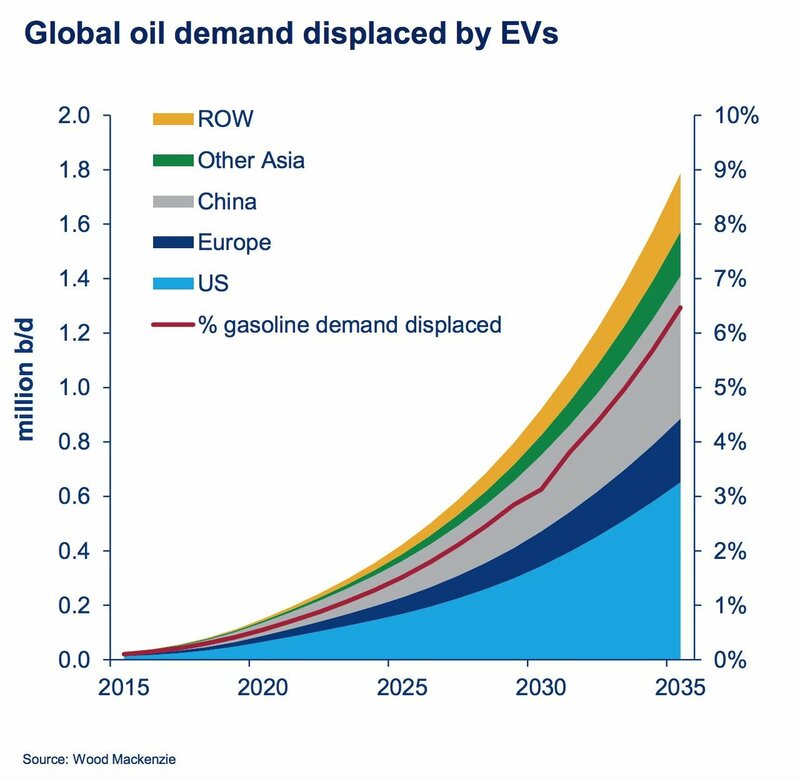 In the next 20 years, Wood Mackenzie projects electric cars will knock out nearly 7 percent of global gasoline demand. That will have the biggest impact in the U.S., where a car-obsessed culture leads to more miles driven than in other countries. In countries that require higher carbon reductions -- like in the nationally determined contributions set out in the Paris Agreement -- electric cars reach 20 percent of the total vehicle market by 2035. That would reduce oil demand by an additional 5 million barrels a day, added to the 1.8 million barrels a day in the base case. “While this transformation would be extreme, it is not considered impossible given current policy, investment and technology drivers,” reads the report. Though carbon-reduction policies have stalled in the U.S., they are expanding globally. Many countries, including China, are considering bans on internal-combustion vehicles. Just this week, another domino fell: The World Bank announced that beginning in 2019 it will no longer fund exploration and extraction in oil and gas. The group said the decision was made in part "in recognition of a rapidly changing world." EVs are a big part of that changing world.